San Francisco Giants top pitching prospect Kyle Crick was dominant in his first start since returning from the disabled list after being sidelined for nearly two months with an oblique strain. In Friday night’s contest with the High-A San Jose Giants, Crick pitched four scoreless innings and struck out 10 batters en route to a 3-2 victory over the Stockton Ports. 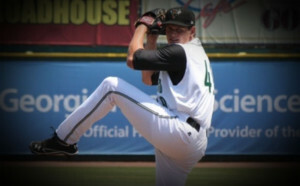 In four starts with San Jose this season, Crick boasts a 0.66 ERA in 13 2/3 innings of work. In his first full season in the minors last season, Crick started 22 games for Low-A Augusta, posting a 7-6 record and 2.51 ERA along with a 128/67 strikeout to walk ratio in 111.1 innings of work. A first-round (49th overall) draft pick in the 2011 MLB Amateur Draft out of Sherman High School (Texas) by the San Francisco Giants, Crick has quickly ascended the ranks as the top pitching prospect in the Giants organization. Crick has plus potential, although he possesses raw talent at the current moment, as has been seen with issues concerning his control. Crick boasts a plus fastball that he is continuing to better command and a two-pitch breaking ball arsenal, highlighted by a slider that is developing into a second plus pitch. Crick has a diverse arsenal comprised of multiple pitch offerings, in that with the right development and experience, he should be able to enter the big leagues as a legitimate front of the rotation starter for the Giants. Crick has all the pieces to the puzzle, it’s just a matter of putting them together for the future Giants ace.